Wagonhound Land & Livestock’s Shiney Nu Annie leads the pack of NRCHA derby winners in Fort Worth, Texas. At the National Reined Cow Horse Association (NRCHA) Celebration of Champions, Monday, February 16, it all came down to one more trip down the fence for finalists in the Aaron Ranch Cow Horse Classic Derby. The champions were determined when their fence work-only score was added to their three-event composite from the preliminaries. Open Champions Shiney Nu Annie (Shining Spark x Annies Nu Lena x Nu Cash) and Chris Dawson, of Burneyville, Oklahoma, came into the finals in fourth place after the first three events, 7 points behind preliminary leader A Lil Dab Will Do (Cat Man Do x Dainty Little Step x Wimpys Little Step), bred by the W.T. Waggoner Estate, of Vernon, Texas, and shown by Robert Chown of Gainesville, Texas, for the Barker Family Trust, of Whitesboro, Texas. Shiney Nu Annie turned in a gritty fence run, earning a big 150 from the judges to take home the winning paycheck of more than $12,300. 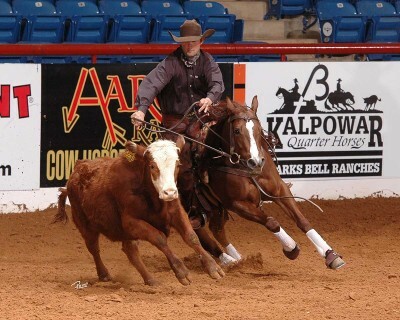 Shiney Nu Annie, a 2011 mare bred by Carol Rose, of Gainesville, Texas, and owned by Wagonhound Land and Livestock, of Douglas, Wyoming, was the 2014 NRCHA Snaffle Bit Futurity Open Reserve Champion with Dawson.